NimbleSchedule application provides another awesome solution for you to choose from as a tool to transfer employees’ data and their approved time off requests from your BambooHR account. 1. Click on the MyAccount link. 2. Click on the Applications. NimbleSchedule imports the following employee data from BambooHR- address, mobile phone, positions and approved time off requests. Note: When an employee is 'terminated' in BambooHR, he becomes 'terminated' in NimbleSchedule too. 1. Employee ID and employee names have to be the same in both applications. 2. NimbleSchedule imports employees’ data only if the respective employee is assigned on at least one position in BambooHR. 1. NimbleSchedule imports employee data only if the respective employee is assigned to at least one position in BambooHR account. 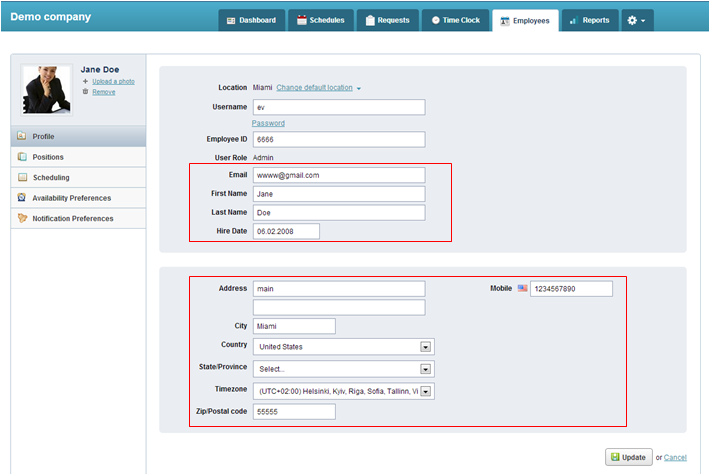 In both cases, if employee’s location, department or positions do not exist in NimbleSchedule account, they are automatically created in NimbleSchedule. How do I generate an API key from BambooHR? In order to generate an API Key, log into BambooHR, and click on the link at the very top of the page where it says, "Hi, Username". This will then give you a drop-down where you can select API Keys and then create one. In the next couple of weeks, the header design will be changing a little bit and instead of clicking on the "Hi, Username" link, you will just want to click on the thumbnail photo icon of yourself which will be in the far, upper, right-hand corner of the page .